Enhancing contrast: Photo editing software (such as Adobe Photoshop or GIMP) contain functions that enhance the contrast of an image. Find the menu point “Auto Levels” or simply “Levels”. This tool will make the darkest part of the image black (even if it was not black before) and the brightest part white. The resulting image will have the same information content, of course, but it may be easier to see the different structures. The photomicrograph will also not have its original color distribution anymore. This may be desired if the original picture has a red color tint due to the lamp of the microscope. Sharpening: Photomicrographs can be sharpened. This process results in aesthetically more pleasing images (if not overdone) but it too will not increase the information content of the image. The software enhances the contrast of the edges that it finds. An over-sharpening of photomicrographs results in so-called artifacts. The background noise (random color fluctuations) of the image is increased as well and structures that are not relevant may become more pronounced. Increasing depth of field: It is in the nature of compound microscopes to possess a limited depth of field. This can be an advantage, because it allows the observer to “slice-through” the different layer of a sample. By turning the fine-focus knob, it is possible to observe the different depths of a sample. When making photomicrographs, this may be a disadvantage, however. 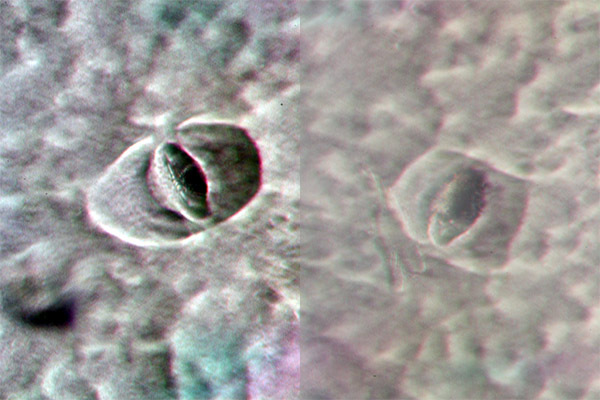 There are software packages available (see the links page) which are able to combine several photomicrographs (each on taken with a different part of the specimen in focus) into one final image. This process is called image stacking. The quality of the final photomicrograph depends both on the number of different images processed and if the focus of the images was sufficiently close together. See a stack of six separate photomicrographs of a Kiwi fruit. Impression of a leaf epidermis on white wood glue, oblique illumination. The color levels of the left image were adjusted to use the maximum contrast range. The right image shows the original color.